You’ve just put on the ring and expecting a wedding in the next several months. The thought of all the wedding preps, from venue, to clothes, food to entertainment, all continuously switch gears, but are running around in your mind. You want to make the best of your special day; it should be perfect, flawless, and fun and yes, stress free (though that’s not entirely possible)! Flower arrangements – there is no Indian wedding without orange and red flowers. Add red roses to the arrangement, and may be even rose petals on the stage to create a more traditional look. Give out gajras (bracelets/bangles) made of orange flowers, with a big red rose in the middle. You could also add flowers for center pieces as part of the venue décor. Make the entrance of the wedding venue very very Indian by decorating it with red and orange flowers. Traditional Mandap like Stage – even if you don’t intend to use a Mandap for its specific purpose, you can have a Mandap like stage to add as an element of Indian wedding décor. Gold pillars give an absolute regal look and are the highlight of a traditional Indian wedding. The top of the Mandap is decorated with real and fresh flowers; use flowers according to the theme to give it a cohesive look. Desserts by color – to give the wedding theme an extra touch of excitement, use color desserts. For an orange and red themed wedding, you can choose gajar halwa (red) or sooji halwa (orange). 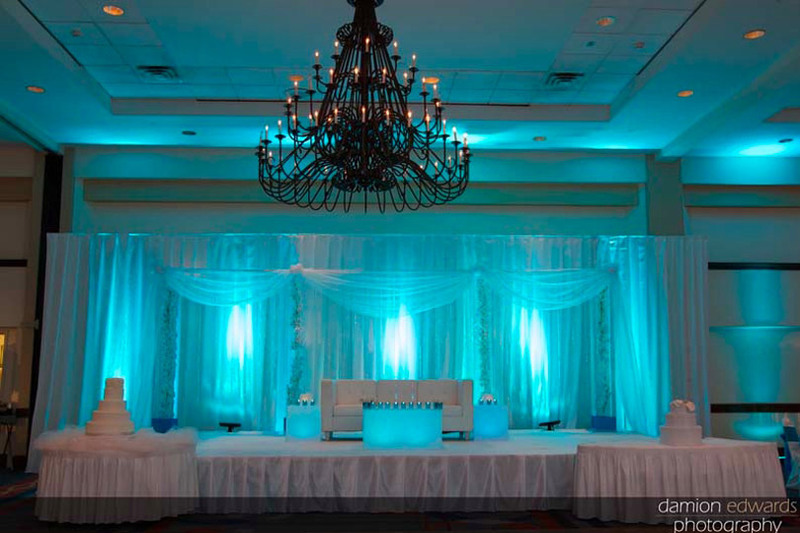 You may extend these color coordinated ideas to other aspects of the venue décor. Traditional wedding cake – The wedding cake is a special three tiered cake to be cut by the bride and groom. To add an element of glamour with a touch of Indian tradition, have a color coordinated cake. You can have a cake made with beautiful orange and red fondant flowers decorated on it. Doli for the bride – the bride enters in a doli with beautiful designs on it. 4 people on each corner carry the bride in the doli to the venue. This is one of the most regal and glamorous bits of an Indian wedding, and is a classic one too because it never runs out of fashion. There are a hundred more ideas for traditional Indian weddings that you can use to create a unique wedding; you just have to get clever and creative. Glamorous Event Planners offer amazing wedding décor services in Hicksville, NY. So whether it’s a party or a wedding, or even a corporate event, we’re here to help you. What more can make an Indian wedding more glamorous, fun and memorable?